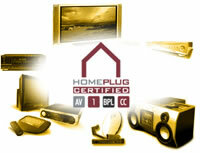 The long-anticipated launch of HomePlug AV specification has finally reached its public release on Thursday last week. HomePlug, or the HomePlug Powerline Alliance to give it its full grand title, is a trade and standards body representing over 50 companies that promote the use of the internal power wiring of a house as a means of providing cheap and quick networking. The theory behind HomePlug is that you simply buy HomePlug compliant equipment, plug it in to a main socket in your house and you have a home network. A boon you would imagine where the property is a few years old and wasn’t wired for networks when built. In practice there have been some problems with it, the most glaring being that if a vacuum cleaner is plugged into the house’s mains and used, its interference reduces the data flow to a trickle. At this time, we are not aware if this has been addresses in the AV standard. The body started in Q1 2000 and knocked out its first specification, HomePlug 1.0 in spring 2001. 1.0 was intended for relatively low bandwidth applications, as it ran at 14 Mbps. In October 2002, they started discussing the idea of HomePlug AV, a much higher bandwidth version that would enable the passing of digitised video around the house – not only Standard Def (SD) TV, but High Def (HD) too. Needing to run video, never mind HD video, required lots more bandwidth, so the theoretical speed to HomePlug AV is 200Mbps, with the 100Mbps (again theoretical) being available for use. The AV release also has good things like Quality of Service (QoS), useful when delivery video and voice around the network, as well as strong security, 128-bit AES vs 56-bit DES of version 1.0. They intend the chips and products which are HomePlug Av compliant to be hitting the market in 3-6 months. We find this pretty surprising given how long the idea has been in gestation, and how many of these standards bodies have pretty open secrets as to which spec they’re going to be running with, well in advance its the public release.